As the guns fell silent across the battle torn fields of Europe in November 1918, a great yearning swept throughout the United States to commemorate the restoration of peace. 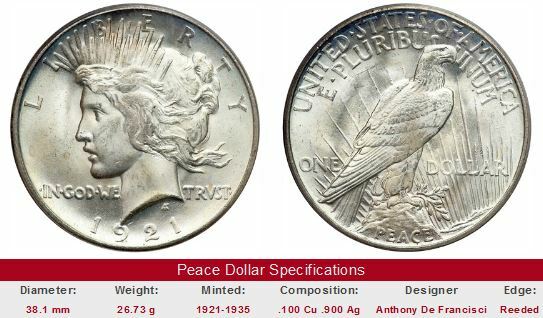 At the American Numismatic Association Chicago convention in 1920, collector Farran Zerbe proposed that a new coin, preferably a half dollar or a silver dollar, be minted to exemplify America’s commitment to peace and liberty. US Coin Values Advisor has cataloged Peace Dollar values over a period of many years for coins of this series. Zerbe’s peace coin proposal was taken to Washington, DC, where it found powerful friends. At the same time, the Treasury Department was operating under the provisions of the Pittman Act, a 1918 law authorizing the meltdown of up to 350 million silver dollars into bullion for the purpose of selling it or making into smaller coins. Furthermore, for every silver dollar reduced to bullion form, the Pittman Act required the government to purchase newly mined silver to mint into a replacement silver dollar. Eventually, 270,232,722 silver dollars ended up in the melting pot, representing nearly half of all standard silver dollars ever produced up to that point in time! The chief beneficiaries of the Pittman Act were Great Britain, which purchased about 96% of the silver to help stabilize a financial crisis in India (then a British colony), and of course, the silver mining interests. To begin meeting the obligation of producing 270+ million new silver dollars, the Morgan silver dollar design was resurrected in May, 1921, following a 17 year hiatus. Within a few months, more than 86 million 1921 Morgan silver dollars were coined. During this time, backers of Zerbe’s peace coin concept were successfully lobbying to create a new silver dollar design. On November 23, 1921, the Federal Commission of Fine Arts publicly invited eight of America’s finest sculptors to submit a “Peace Dollar” design to memorialize the Great War armistice. The winner of the competition was Anthony de Francisci, a naturalized citizen from Italy, whose wife, Teresa, posed as his model for Miss Liberty. The model for the Peace Dollar was Teresa Cafarelli De Francisci, the wife of the coin's designer, Anthony De Francisci. As a small child emigrating to the US from Italy in 1902, her ship passed by the Statue of Liberty in New York harbor. Lady Liberty made an indelible impression on young Teresa. Growing up, she often playfully posed as Liberty, holding her torch high. Modeling as Miss Liberty for the Peace Dollar was a great honor and the fulfillment of a childhood dream, she wrote. Later in life, she was a humble guest at numismatic shows. 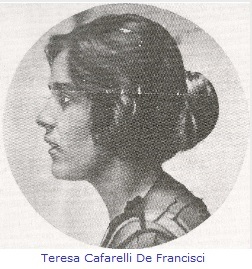 Teresa Cafarelli De Francisci died in 1990 at the age of 92. De Francisci’s Peace Dollar obverse portrayed a svelte Miss Liberty, wearing a radiant crown. His original reverse depicted an eagle smashing a sword, which brought howls of protest from many Washingtonians, because in their eyes, the image suggested defeat, not victory or peace. Mint Engraver George Morgan quickly revised de Francisci’s reverse design by removing the sword, inserting an olive peace branch in the eagle’s talons, and superimposed the word “PEACE” at the bottom. De Francisci's powerful eagle was perched on a rugged, steep slope, gazing toward a sunrise, symbolizing the dawn of a new era. Production tooling was quickly fabricated, and on December 26, 1921, the first Peace silver dollars were minted. Over the next 6 days, a total of 1,006,473 Peace Dollars dated 1921 were made. All 1921 Peace Dollars were struck in high relief, meaning details of the coin “stuck out” away from surface of the coin. As attractive as this effect was, high relief coining proved problematic in the manufacturing process, so all Peace Dollars dated 1922 and later featured less appealing, low relief characteristics. Sometime during 1928, the Mint reached the magical total of 270,232,722 silver dollars produced since 1921 (Morgan and Peace Dollars combined). This total equaled the same number of silver dollars melted down years earlier under the Pittman Act, and these newer silver dollars fulfilled the replacement mandate of the same law. Since there was no public demand for silver dollars, production of the Peace Dollar ceased. The Peace Dollar returned briefly in 1934 and 1935, because Treasury needed some additional silver specie to back up silver certificates. Sadly, the end of the Peace Dollar series in 1935 foreshadowed events to come. Within four years, the world was once again engulfed in war. These are the key dates of the Peace Dollar series. Whenever coin prices in general are on the rise, look for this duo to do the best amongst this group. The 1921 Peace Dollar, even though a key date, remains affordable for most pocketbooks. The 1928 is more pricey, but most collectors can buy one if they scrimp and save a bit. Some proof specimens, dated 1921 and 1922, are known to exist. Peace Dollar proofs are extremely rare and valuable, numbering perhaps no more than 30. Peace Dollars are not far behind their Morgan Dollar counterparts on the Buyer Remorse scale. The beauty and availability of Peace Dollars gives hucksters ample bait to reel in uninformed collectors. They chum the water with "bargains" that are actually overgraded coins by honest numismatic standards. Buyers don't discover this until they're ready to sell. That "MS-65" coin for which they paid an MS-64 price is really an MS-63. That bargain wasn't such a great deal after all. Scenarios like occur all too often and have dissuaded many budding collectors from becoming active hobbyists. The best way to avoid getting turned off is to purchase only examples that have been graded by PCGS, NGC, ICG, or ANACS, or at least are being sold by a reputable dealer. The left hand side of each "Sales Box" below contains Peace Dollar values over a very long period of time for key dates in F-12 condition. The percent annual increase is computed for comparative purposes. The right side of the box is a link to eBay US coin auctions, that pulls coins of these dates in all conditions offered. The coin pictured for sale in the right hand side is not necessarily the same condition coin as that represented in the value trend analysis on left hand side.